Herbert Max DeWolfe Service Details - Kitchener, Ontario | Henry Walser Funeral Home Ltd. Passed away peacefully in his sleep on Saturday, September 8, 2018 at University Gates, Waterloo one month after his 102nd birthday. Max was born in New Brunswick. He trained for the ministry at Acadia University where he received his B.A., B.D. 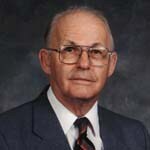 He was ordained to the Baptist ministry in 1940, and served in pastorates in the Maritime Provinces, Quebec and Ontario. He also served as a Chaplain to the Canadian Army during WW II, and in the YMCA War Services. In 1981 he and his late wife Margaret retired in Kitchener-Waterloo where they were involved in interim pastoral ministry including three terms at Highland Baptist Church. Predeceased by his wife Margaret DeWolfe (2016) and his two daughters Elizabeth and Emily. Survived by his son John (Maureen) of Halifax, his stepdaughters Sharon (Bob) of Waterloo and Brenda (Bruce) of Ottawa and his three grandchildren Warren (Coleen), Kathryn (Brad) and Heather. Max's family will receive relatives and friends at the Henry Walser Funeral Home, 507 Frederick St., Kitchener 519-749-8467 on Friday, September 14, 2018 from 4-6 p.m. and from 2 -2:45 p.m. on Saturday, September 15, 2018 where a memorial service will take place in the chapel at 3:00 p.m. officiated by Rev. Das Sydney. Reception to follow. As expressions of sympathy, donations to Highland Baptist Church would be appreciated by the family (cards available at the funeral home). Special thanks to all the caregivers at University Gates for all their special and loving care of Max. Visit www.henrywalser.com for Max's memorial. We encourage you to share any memorable photos or stories about Herbert Max. All tributes placed on and purchased through this memorial website will remain on in perpetuity for future generations. Max was our Minister at First Baptist Church in Montreal. He was a great and inspirational preacher and a great supporter of our youth group. My family visited him and Peggy in Liverpool NS when I was being dropped off at Acadia, where I was studying geology. He told me that he had taken geology as an elective when he was at divinity school at Acadia. He recalled an exam where he was asked to explain how mountains were formed. He answered "God did it." His professor gave him a zero, adding the following notation "I know that God did it. I wanted to know how He did it." Dear John and Maureen: Max led a wonderful life and we are saddened to hear of his passing. Our thoughts are with you at this time. We met Max and Peggy in 1988 when we began our ministry at King Street Baptist Church, Cambridge, ON. where Max had been the interim pastor. We developed an instant bond of friendship despite the difference in our ages, and enjoyed years of fellowship - often enriched with laughter and humour. Max was a great story teller, and had the endearing quality of being able to laugh at himself. He was man of integrity and thoughtfulness, a gifted preacher, and a wonderful example and mentor to us. He and Peggy made a great team, and we are thankful to have known them. We offer our sincere sympathy to the family at this time. My father and Max served in the same unit in NW Europe during the war. Dad held him in very high regard and shared a few amusing anecdotes from their service together. Co-incidently, I met Max at the Saint John airport 57 years ago as I was on my way to King's. He impressed me deeply. Several years later Max came to Liverpool to fill in at the Baptist Church. Although we were not cogregants, we were able to renew a family friendship and expand it. He was a kind, sincere deeply Christian man imbued with a generous sense of humour. It was a privilege to share his friendship. Dear John, Sharon, Brenda, and families, I have known Max for many years, primarily between the mid 80's to the mid 90's, during which time I lived with the younger of his 2 late daughters. I felt proud to be closely associated to a member of the clergy and honoured to attend a few of his sermons over the years. I continue to reside in the area where he preached (First Baptist Church) and where the family lived on Hampton Ave. I witnessed a caring father who raised 3 accomplished children. One became a beloved teacher, one a musician, and one a family law attorney. He instilled in them a charitable goodness which remained alongside some challenges his daughters experienced over the years. Some 22 years ago I was in Kitchener-Waterloo to celebrate Max's 80th birthday. It was one of many occasions where I observed his loving relationship with Peggy and his warmth and affection towards her daughters and their families. In later years, when Peggy's health was fragile, Sharon managed to help the 3 of us get to a nearby shopping centre for lunch together. That was a special day and a memory I will continue to cherish. I am unable to travel to Ontario this weekend but my thoughts will be with you all. Please accept my heartfelt condolences. I first met Max and Peggy in the late 70s when they moved to Liverpool, NS and I presided at his Induction Service there. We collaborated often, especially in the Atlantic Baptist Fellowship. Years later when I was Senior Minister of First Baptist Church Halifax he was the Guest Speaker for the 170th Anniversary of this congregation he himself had served so well in the 50s and 60s. Max was an inspiration to me and many other "younger" clergy and a shining example of a true servant of God. May God bless and comfort his family and friends. Rest in peace and rise in glory!